Here you'll find a great selection of bounce and slide combos that are approved for use with water. 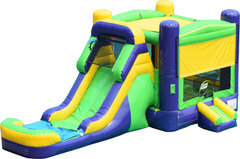 You'll all the excitement of a water slide combined with the popular bounce house. Just add some water and the whole gang will be slip, slidin' to a great time! All of our bouncers are manufactured with "Lead-free" vinyl for your child's safety, and all units are cleaned and sanitized after every rental. Browse the selections below and click on the image or "More Info" to get additional details and to make a reservation.